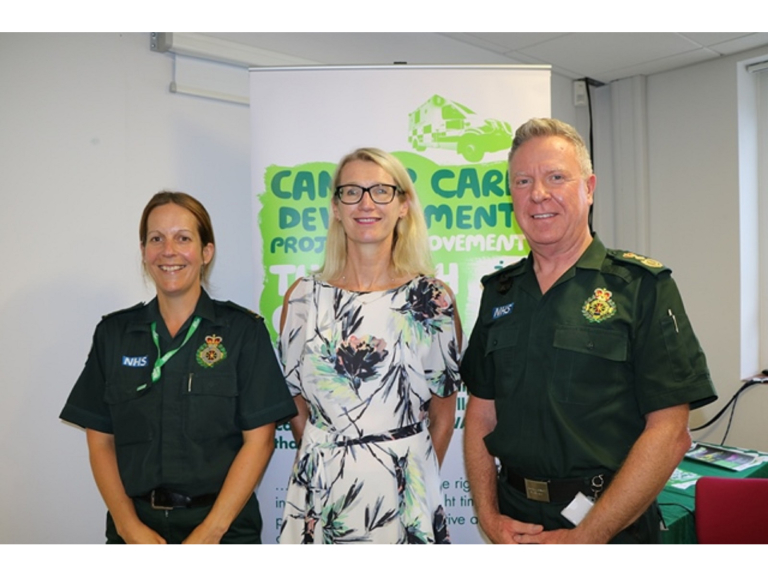 The Chief Executive of Macmillan Cancer Support visited a ground-breaking team of ambulance clinicians who have been working on a new joint project which is benefitting patients across the South West who have cancer, palliative care needs or who are close to the end of their life. Lynda heard all about how the ambulance service can now provide improved urgent and emergency care for patients and their loved ones, by either supporting management at home or facilitating referrals to a more appropriate health setting. Ambulance services regularly encounter patients with cancer, yet they often have very little training about the illness so may lack the skills and knowledge to provide the best quality care. Sometimes, people with cancer are conveyed to the hospital emergency department when it would be more appropriate for them to remain at home. In the first collaboration of its kind, the South Western Ambulance Service and Macmillan have come together to combat this this gap in education and provision. Lynda will be hearing first hand some of the feedback directly from the team and listening to the patients’ case studies who have been treated by paramedics in their own homes, along with a show case of the project’s outcomes and benefits. The aim of the Macmillan Cancer Care Development Project is to improve and promote best practice in cancer, palliative and end of life care for patients who access urgent and emergency care by calling 999. As well as creating a broad education package for paramedics, the project team have also developed and improved systems and protocols to give ambulance clinician’s access to specialist advice and guidance whilst they’re on scene. Ultimately, this ensures cancer patients receive the right care in the right place at the right time.